WATER WORKS : Contractors recently installed a water line for new fire sprinklers for Project Amend's proposed drug and alcohol detox facility in SLO--marking the latest hurdle the group has cleared. marking an important milestone in the long process of obtaining a state license for a residential rehab center in the city of San Luis Obispo. Project Amend already runs its house off of Broad Street as an eight-bed sober living facility for men and plans to offer medically supervised detox in addition to group psychotherapy, counseling, and education. The nonprofit group has been working for months to find funding for the required fire sprinklers at the center, and installation is now complete. "The community has rallied behind us. 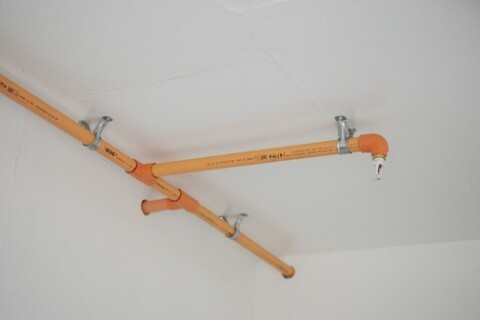 Their support got us to this place," said Project Amend's drug and alcohol counselor Michael Axelrod as he looked at the orange PVC pipes freshly bracketed to the ceiling. Outside, the yard and street have been dug up for the required new water line. Once the fire marshal signs off on the work, Axelrod plans to send in the thick application required for the much-anticipated license. "I hope the process can be expedited because of the tremendous need in this county," he said. Currently, he added, people with addictions are sent to Santa Maria for medically supervised live-in detox. "I get calls all the time from people who want to find a place for their husband or brother or son, and they're surprised and even angry that there's nothing in San Luis Obispo," Axelrod said. # affected by the disease of addiction," he added. "We're living in freaky times, and some people are looking for a mood-altering substance. At first it seems to alter their mood for the better, but then it becomes a different thing." Publicity about Project Amend's efforts last spring eventually led to county approval for a Community Development Block Grant of around $20,000 to pay for the fire sprinklers. Anonymous donors also offered thousands of dollars to help run the facility, he said, but funds are still tight. "I hope we can survive till we get our license. We have the money for the fire sprinklers, but not for lights or rent," he added. For anyone who's feeling generous or needs a tax deduction, Axelrod noted, the nonprofit Project Amend (782-9600) is looking for cash, computers, office equipment, bedding, a lawnmower, and volunteer labor.